All transactions are safe and secure with a reliable history in online purchasing behind each of our associates. 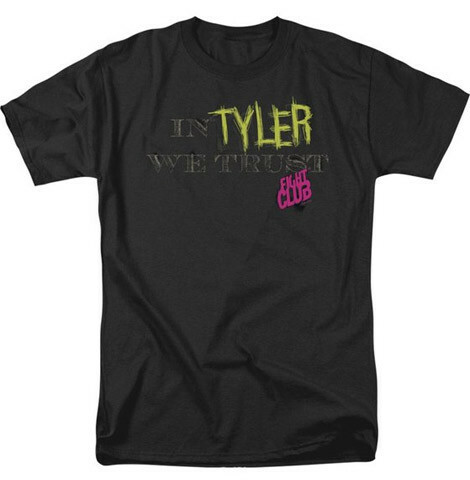 Buy the Fight Club In Tyler We Trust t-shirt to own Fight Club clothing and merchandise. Anyone familiar with Chuck Palahniuk's book knows that like the fight club, Project Mayhem is also governed by a set of rules, one of them being, "You have to trust Tyler." The front of this tee displays the motto, "In Tyler we trust". Of course, discussing this shirt could violate the first rule of Fight Club, "You do not talk about Fight Club." Available on a short-sleeve t-shirt, the design is a perfect way to express your loyalty. In addition to the Fight Club In Tyler We Trust tee above, browse the Fight Club Clothing Gallery for more apparel like men's and women's clothes, kids shirts or hoodies.